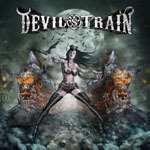 Share the post "Album review: DEVIL’S TRAIN – II"
I reviewed the Devil’s Train debut album in 2012 and was very impressed describing it as “a wonderful gut-churning, ball-grabbing, riff-fest”. All credit, then, that this is more than just a one-off project for ex-members of Stratovarius, Mystic Prophecy and Evergrey. If you’ve seen the band’s video for the lead single ‘Hollywood Girl’ you might get the wrong impression: it all looks a bit clichéd and old school. The riffs and economical songwriting are still in place and this seems to be pitched from the Slash/Myles Kennedy handbook of hard rocking with a nod to bands like SOiL. As an album of riff-based raunchy tunes it still takes some beating from the relentless churning of ‘Mr Jones’ and ‘Rock Forever’ to the pneumatic ‘Girl Like You’. This entry was posted in ALBUM REVIEWS, ALBUM REVIEWS (Mobile), All Posts and tagged album, Devil's Train, Evergrey, heavy rock, II, Mystic Prophecy, review, Stratovarius. Bookmark the permalink.